Increase your profitability by managing hard-to-control broadleaf weeds with Pindar® GT herbicide. The premier herbicide for Southeast fruit producers and pecan growers (2018), Pindar GT delivers superior, dependable weed control and long-lasting residual activity. Pindar GT also provides a new resistance management tool, enabling you to optimize your orchard’s weed control. Your toughest weeds are no match for Pindar® GT herbicide. 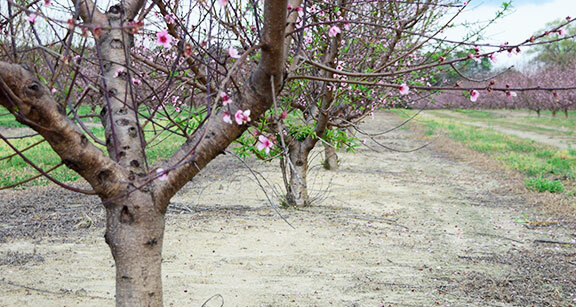 Get the peace of mind that comes with consistently clean orchards and increased profitability potential. Pindar® GT herbicide (2 pt./A) delivers superior, lasting marestail control compared with a competitor’s treatment. Start the season with a clean orchard floor, minimizing competition from broadleaf weeds while maximizing radiant heat and orchard health. With two modes of action, Pindar GT provides dependable weed control and up to six months of residual activity. An innovative product, Pindar GT contains two active ingredients — penoxsulam (Group 2) and oxyfluorfen (Group 14). Resistant weeds are no match for the superior, broad-spectrum weed control offered by Pindar GT. Pindar GT controls the toughest weeds, including troublesome marestail, pigweed and Virginia pepperweed. The herbicide provides reliable control of 51 weeds — including morningglory, henbit, wild mustard, chickweed and cutleaf eveningprimrose. Pindar® GT herbicide provided almost complete control of marestail in a 2016 North Carolina State University (NCSU) research trial. A fall preemergence treatment of the active ingredients in Pindar GT provided greater than 99 percent control as compared with the 87 percent control provided by a treatment of indaziflam at 0.045 lb. a.i./A. Which weeds will Pindar® GT herbicide control? 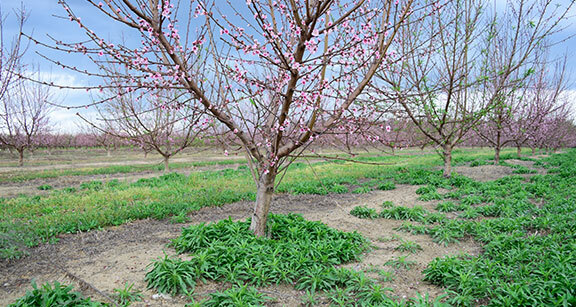 How will Pindar® GT herbicide fit into my orchard’s weed management program? Pindar GT rewards you with a new management tool that provides consistently clean orchards, time savings and increased profitability potential. Tank-mix and application timing flexibility allows treatments to be made anytime postharvest until just prior to bud swell — providing preemergence and early postemergence activity on broadleaf weeds. Pindar® GT herbicide is labeled to control which crops in my state? Pindar is not registered for sale or use in all states. Contact your state pesticide regulatory agency to determine if a product is registered for sale or use in your state. Where can I find more information about Pindar® GT herbicide? Contact your local Dow AgroSciences herbicide specialist who can help you design a weed control program specific to your goals.